The Omron CP1H series of programmable logic controllers is programmed from CX-Programmer. CX-Programmer is part of Omron CX-One Factory Automation Integrated Tool Package. This software package integrates support software for Omron PLC and other components. 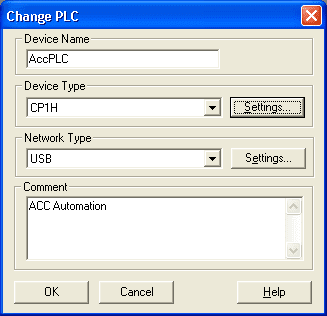 Traditionally you had to purchase and install individual support software compatible with each unit and then connect to each PLC and component. CX-One FA Integrated Tool Package eliminates this by providing one package for operating and setup of Omron PLC’s, Special I/O units, components, networking start up and monitoring. 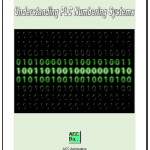 This improves the efficiency of PLC system start-ups. We will be looking at starting CX-Programmer within the CX-One Software package and starting a new project for our CP1H PLC. Let’s get started. 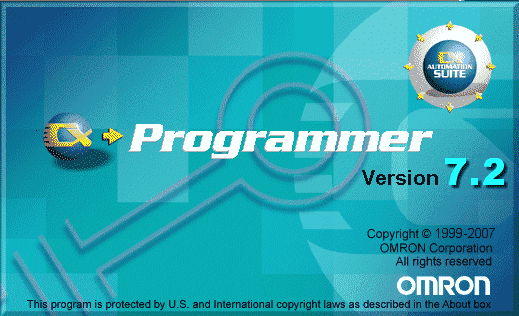 Have a copy of this guide available when you start to program using the CX-Programmer software. 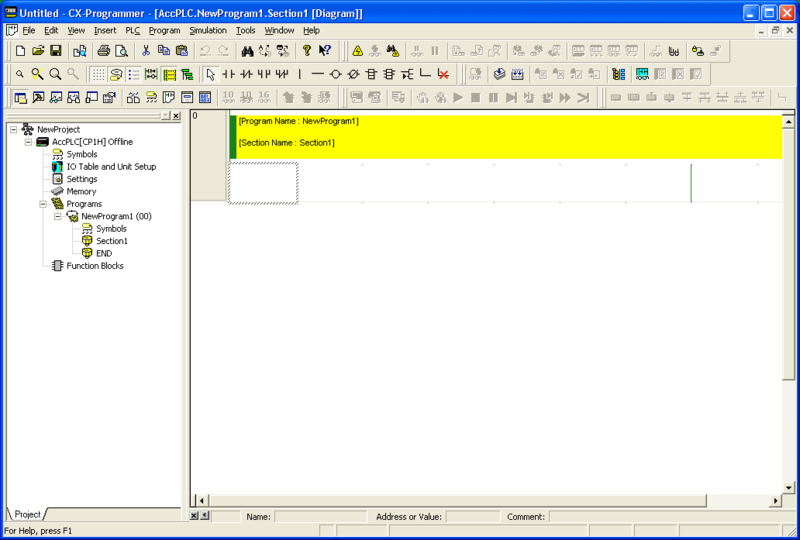 It will also show how to customize the software if you are already familiar with Omron’s older software like Syswin. You can make the function keys operate in the same manner. We will not cover the installation of the CX-One package that includes the CX-Programmer software. If you have any problems with the installation, there is an uninstall file on the installation disk. This file should be used in order to remove all of the software installed with the CX-One installation. CX-One software has been around for a number of years. You can now get your copy from many online stores such as Ebay at a reduced cost. This will start the software and a splash screen will now appear. After the splash screen the initial screen will now be displayed. 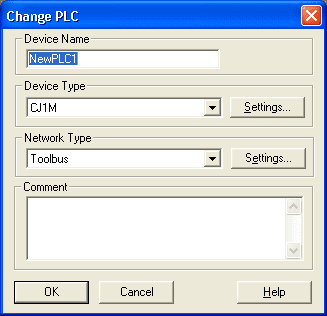 The Change PLC window now appears. 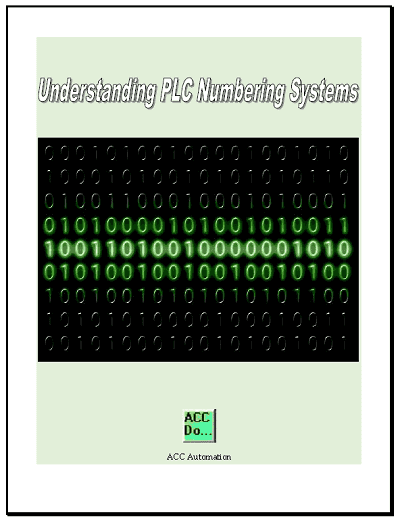 We can set up the PLC on our system. Network Type: USB – Built into the CPU for programming the unit. Next to the Device Type you will see the Settings button. This will allow us to specify additional information on the CPU that we selected. In our case the CPU Type will be set for XA because our Omron model number is CP1H-XA40DR-A. We have no File Memory card so this is left as ‘None’. Notice that all items that cannot be set are dimmed out. Hit OK, which will return you to the Change PLC window. Hit OK again. Our main window now appears. The two main areas of the main window are the Project Tree and the Ladder Window. Project Tree – This is located on the left side has different sections of our system listed. This includes the CPU’s we have on our network, the memory tables, programs, function blocks, etc. Ladder Window – This is located on the right side of the screen. The Ladder Window is where we will draw our logic using the toolbars located at the top of the screen. We can save our project by selecting the disk icon, Ctrl + s, or by using the main file menu and select File | Save. We will call this project file ‘Start Stop Jog’. 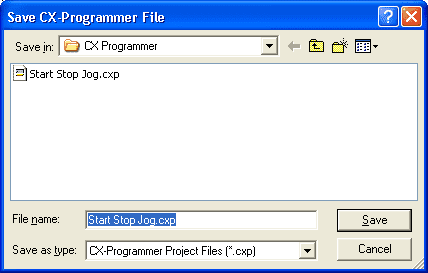 You will see that the extension for a CX-Program file CXP. Select ‘Save’. We now have the program saved. Click on ‘Section1’ of our project tree. 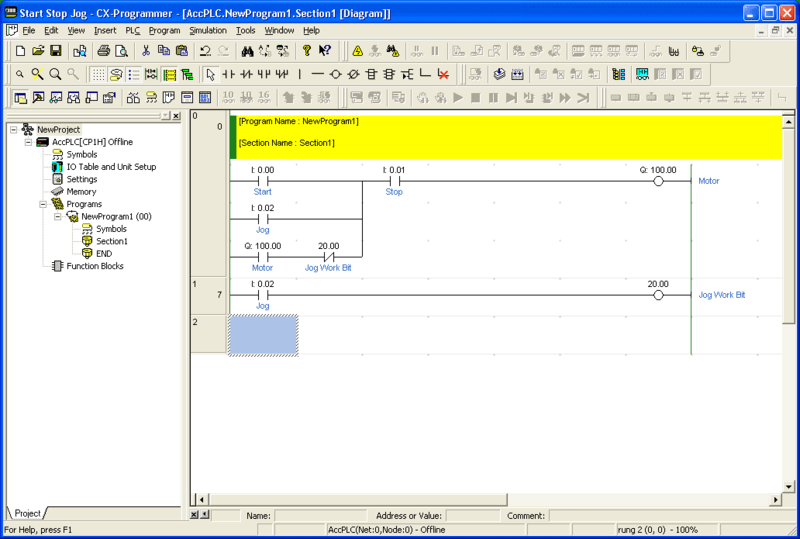 This is where we can start to enter our ladder logic. You will notice that we have an ‘END’ section which contains an end statement rung. This is a basic requirement for any Omron program. 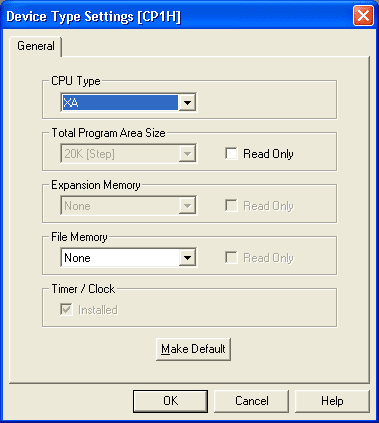 It tells the processor that this is the end of the program logic; continue again at the beginning. 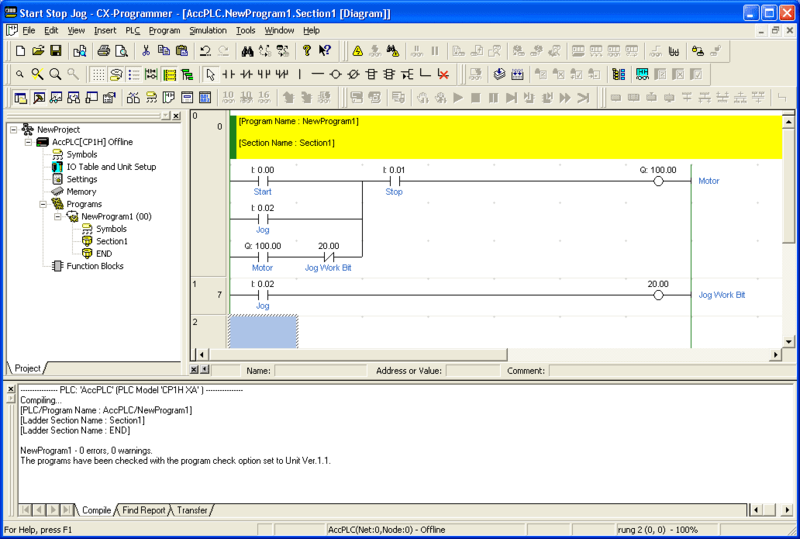 We will now enter ladder logic code in the Ladder Window of Section1. This logic will be a Start, Stop, Jog circuit. Have your CX-programmer Installation Guide handy while programming in this logic. Once the logic has been entered, we can now check for errors. Select from the main menu, Program | Compile. 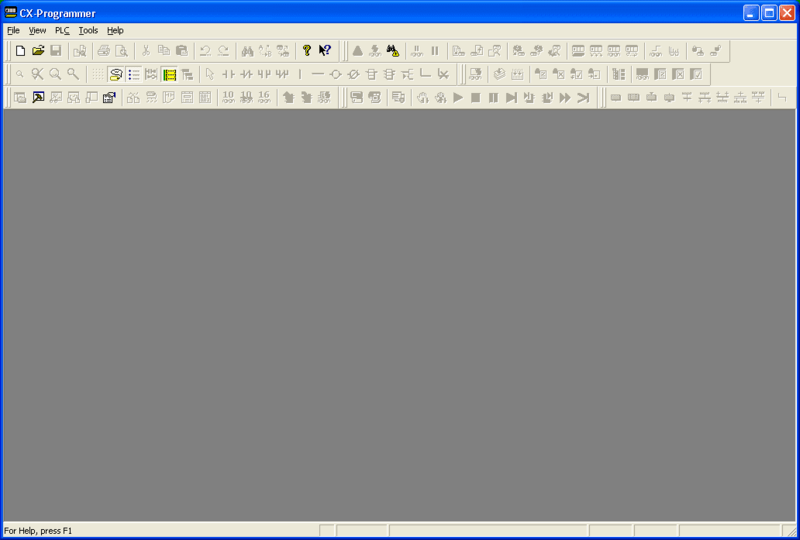 You may also use Ctrl + F7 or the symbol on the toolbar that looks like a stack of papers and an arrow. Any errors when compiling will now show up in the Output Window. In our case we have 0 errors, 0 warnings. See the actual programming of this circuit by watching the YouTube video below. Next time we will look at establishing communication with the CP1H PLC. I have been looking for a orkom programmer here in WNY , Buffalo. If you know somebody please email me asap. Have you tried the system integrator’s list on the Omron website?